Located in the Flemish province of West Flanders, Ostend is the largest city on Belgium’s coast. It began as little more than a modest village that managed to gain town status by 1265. In 1395, due to the unstable coastline, the town was moved further inland behind the protection of the large dikes. Thanks to the moderate climate, Ostend enjoys mild summers and winter temperatures rarely reach freezing. This makes the city as pleasant for the locals as it is for visitors. In terms of facilities and hotel accommodation, Ostend has every angle covered. From cheap guest houses to 4 star and 5 star luxury hotel rooms in Ostend. No matter your person preference or budget, you are bound to find several suitable accommodation options to choose from. If you enjoy walking and the fresh sea air, then take a stroll along the local beaches. There’s nothing more enjoyable than an early morning or sunset walk with the soft sand beneath your feet. Ostend is particularly well-known for its fishing industry and you too can enjoy the catch of the day simply by making your way to the local fish market. A walk along the local harbour / quay from your Ostend hotel accommodation is another great waterside activity. During the day the locals set up stalls with all kinds of items for sale. 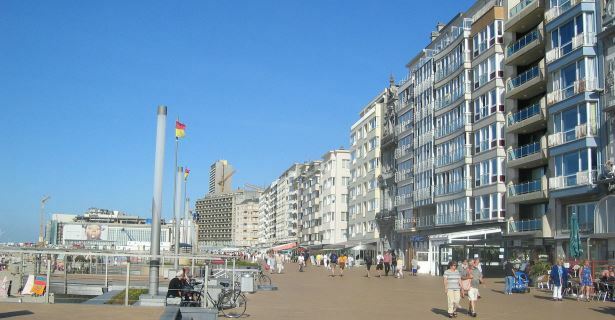 Walking along the Albert I Promenade is another favourite among locals and tourists staying in Ostend. The crisp, fresh air and beautiful scenery that accompanies you along the way makes for the ideal romantic stroll. While in the harbour area, make sure that you check out the Mercator. This three mast sailing ship served in the local navy and also won the Oslo-Oostende race among other accomplishments. A day in Leopold Park is perfect for the whole family. Why not stop at a nearby café, pick up some local treats and enjoy a relaxing day while you let the kids run and play? The main square, Wapenplein, is another must for visitors staying in central Ostend. Although it’s fairly new compared to other Belgian squares, it is still a wonderful part of the local history and culture. During the summer months, many gather at Het Vissersplein to enjoy various musical acts. If you enjoy such activities, you should definitely plan your trip to Ostend with this in mind. If you fancy a relaxing bit of therapy, the local spa facilities are always a huge hit and perfect for relieving you of your daily stress. Of course, if you plan on making regular use of such facilities, you may want to look into booking in at an Ostend hotel or resort that includes these extras in your holiday package. You will find that these Ostend hotel accommodation deals are a lot more cost effective than visiting the spa every other day. In terms of shopping in Ostend, the city centre has everything your heart could possibly desire. The key is to take your time, look around and enjoy the experience of shopping as much as making actual purchases. The local nightlife is certainly alive in these parts and you will come across numerous venues to choose from. Ask the locals or look up some reviews online to find out which ones you will enjoy the most. From quieter restaurants or cafés to upbeat clubs – you have every option available to make every minute of your Ostend vacation unforgettable.